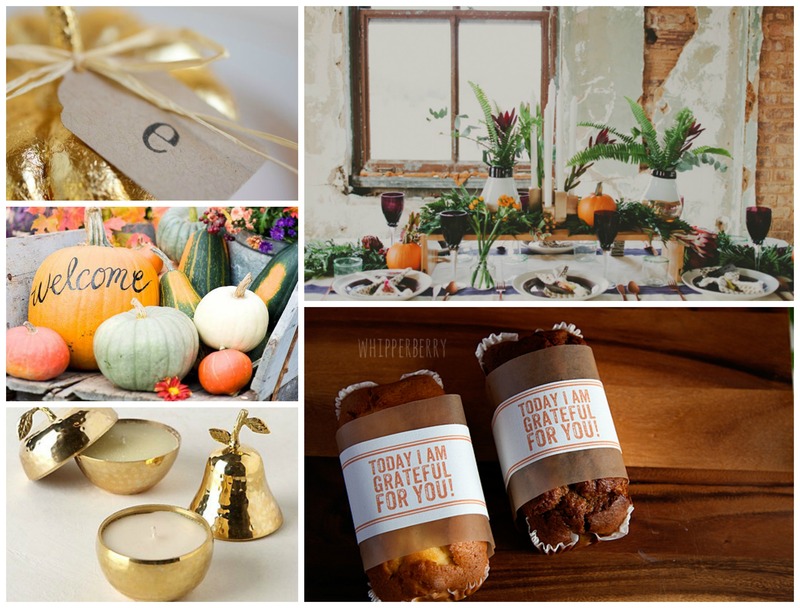 No, not EScape, but TABLEscape! 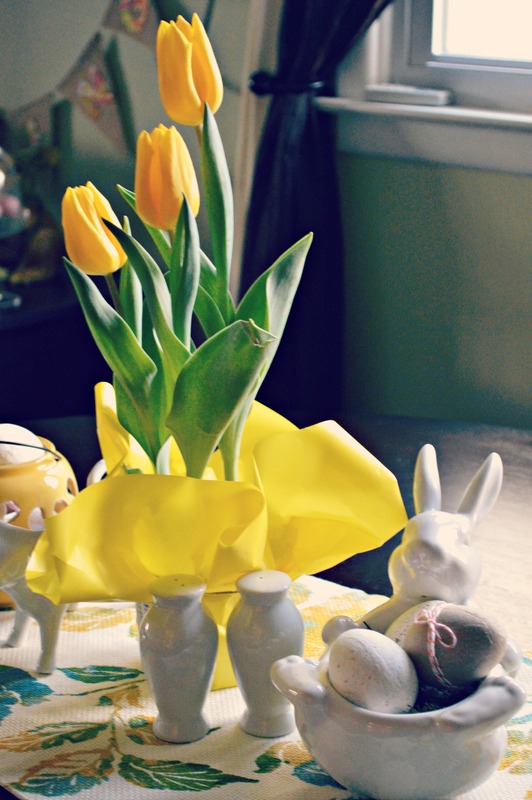 I took a package of paper mache eggs and a few supplies I already had and threw together the easiest egg decorations ever – which, when paired with some gorgeous spring tulips, is simplistic decor at its best! We just have a little round dining room table (purchased two years ago from Pier 1). We rarely have guests or dinner parties, since our place is pretty small. 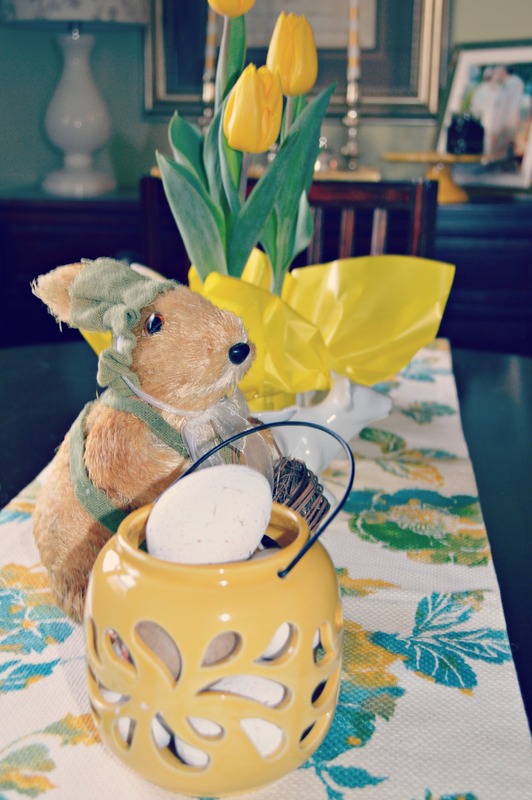 But that doesn’t mean I can’t decorate our table each season just for the hubs & I to enjoy! 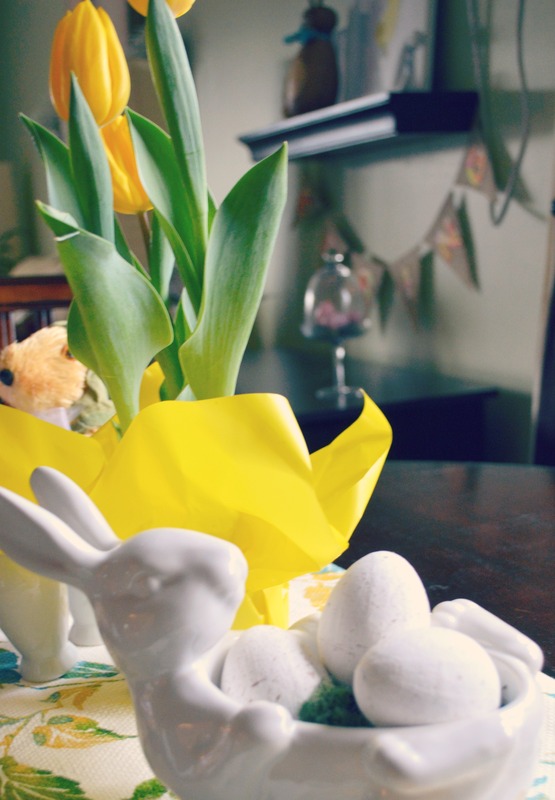 I wanted to get my table ready for Easter – and I had a pack of paper mache Easter Eggs purchased at Michael’s LAST spring, and never used. 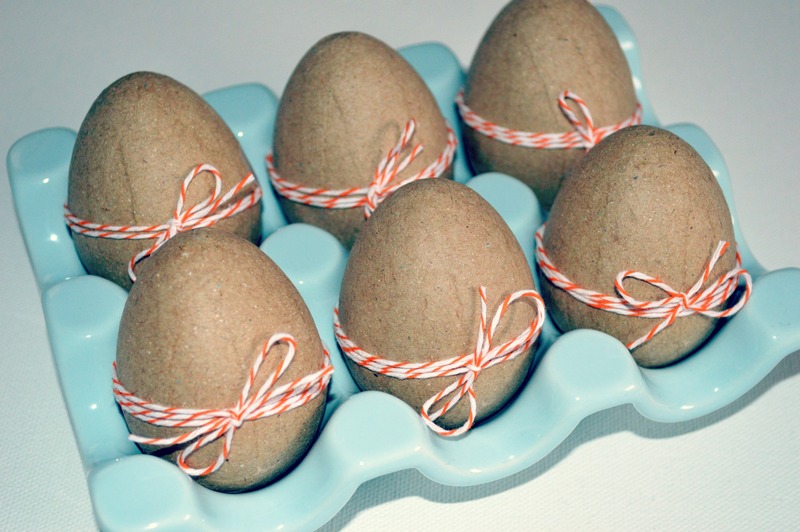 I’ve been super busy this week, and needed a quick & easy way to prep my eggs for display. I did not have time to go to the store – and didn’t need to spend money, anyway. So I opened up my craft cabinet, pulled a few things out, and got to work. 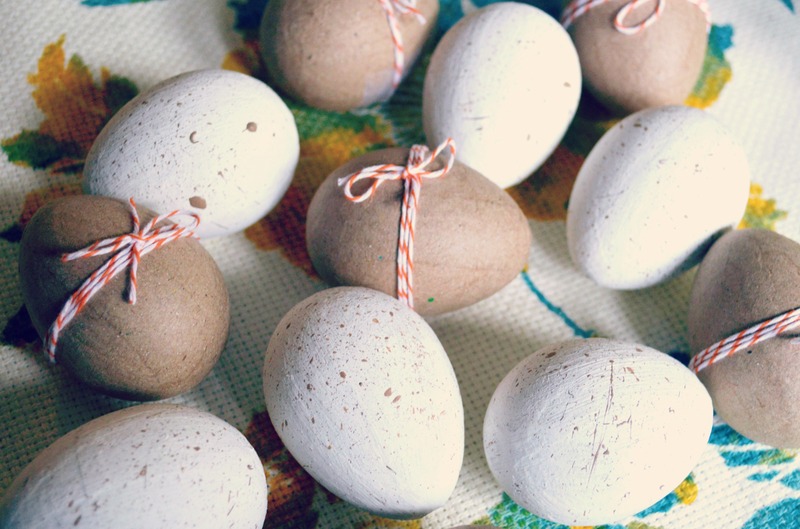 The first, and easiest, project was to take 6 of my eggs & wrap them in some orange baker’s twine. This took all of two minutes to finish, and I think they are rustic & adorable! 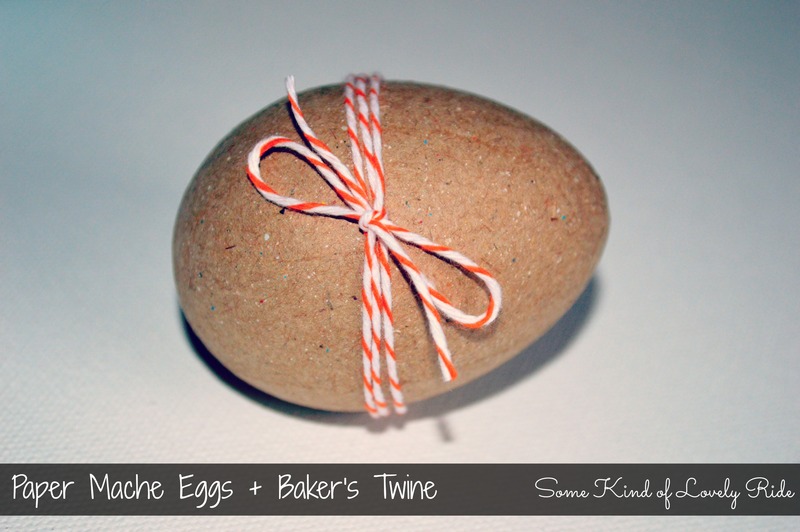 (Any excuse to bust out the baker’s twine is a good one, in my opinion). I made these over the weekend, and they spent the past couple of days hanging out in my ceramic egg-carton dish, which I bought at The Farmhouse Store (my fave!) and typically use to hold my favorite earrings & rings in my bedroom. 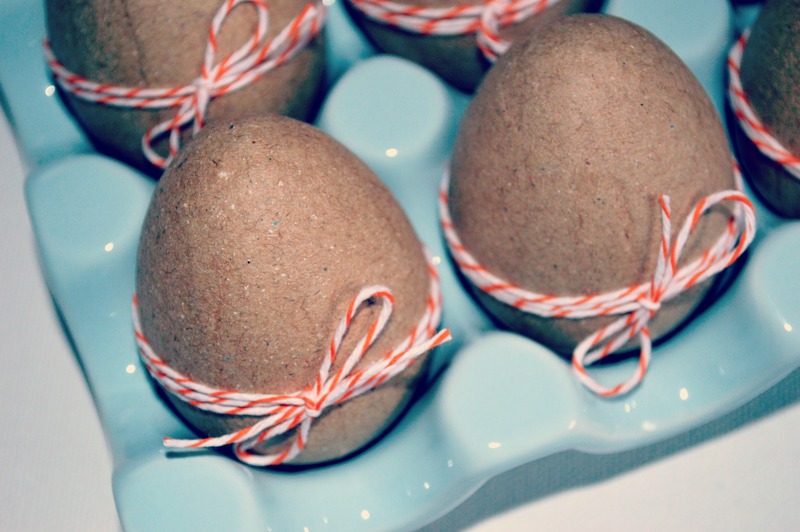 Soon I had a dozen eggs, decorated with minimal effort & ZERO cost! 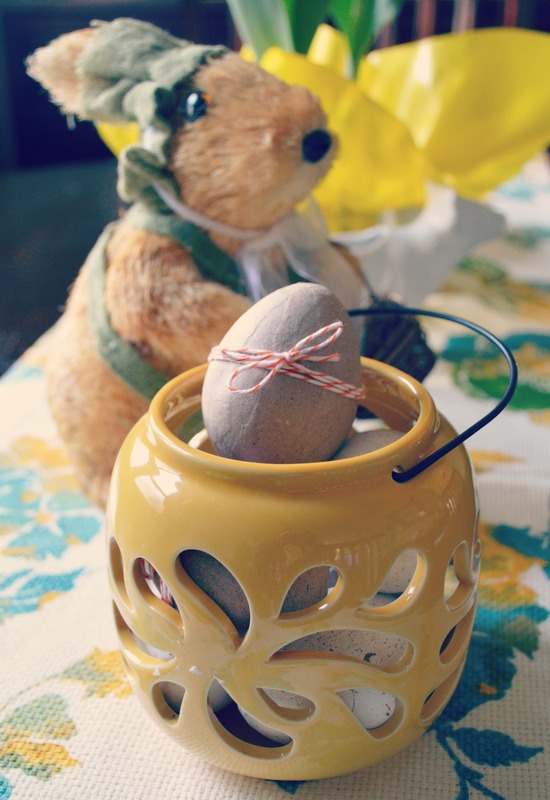 I put a few eggs into my Pottery Barn Bunny Dish – on a little bed of moss. I am obsessed with this dish. Look at those bunny feet! 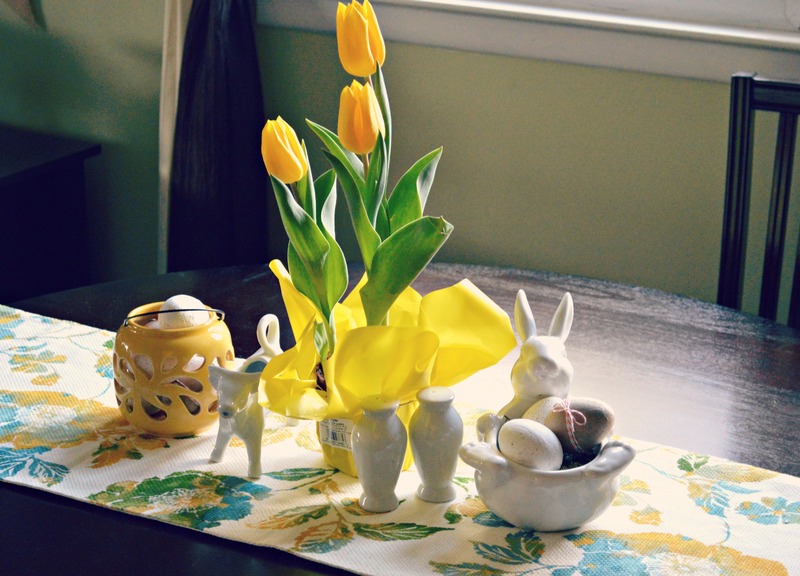 The rest of the eggs went into this little yellow container (bought for $3.99 or so from T.J. Maxx) – which is actually intended for a candle, but I went rouge. See that adorable bunny? I’ll give you one guess where he came from. The thing is, tulips are amazing. 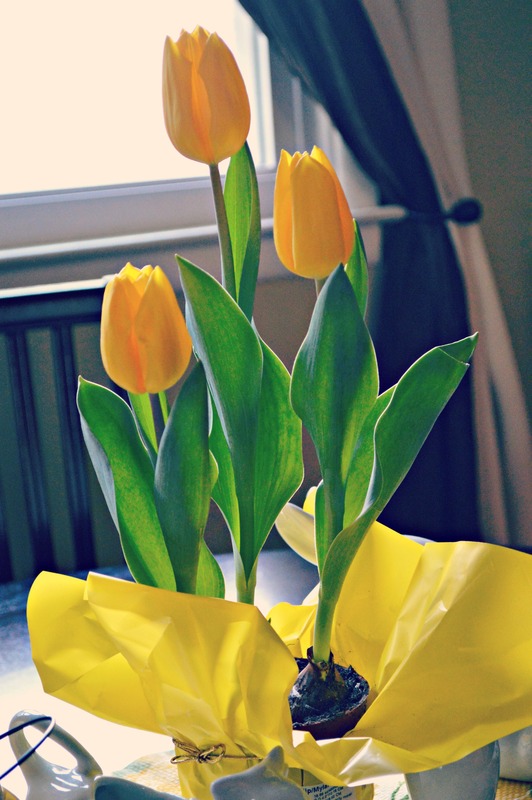 Nothing says spring like a yellow tulip. Oh how I love them. And daffodils. And daisies. And every other spring bloom known to man. 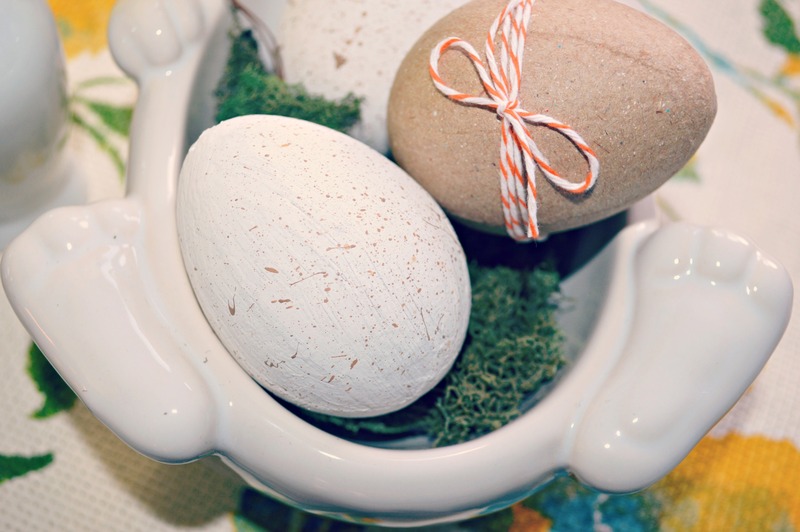 What does your Easter table look like? 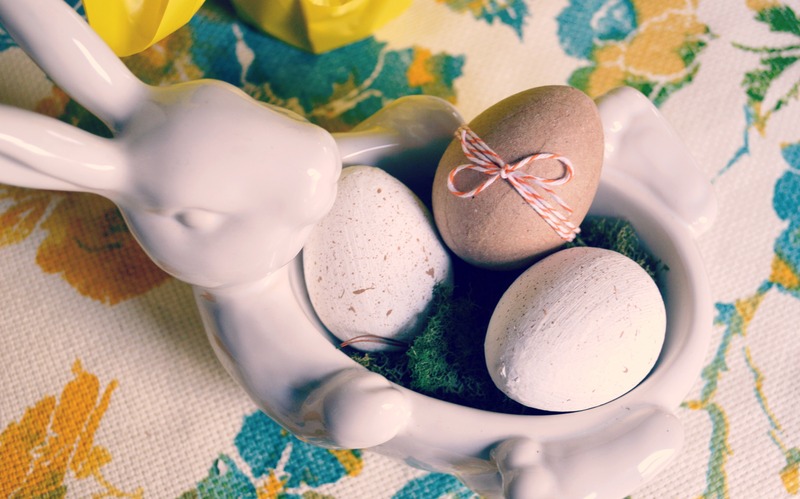 Will you actually be serving Easter dinner on yours? ‘Cause I sure won’t be – so props to you! 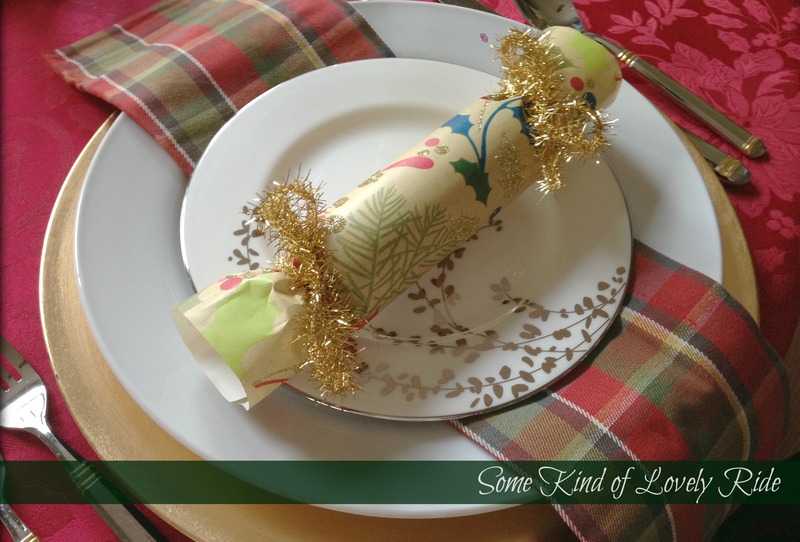 Since I only needed to create my crackers to shoot photos of my tablescape, I decided to take the easy way out. 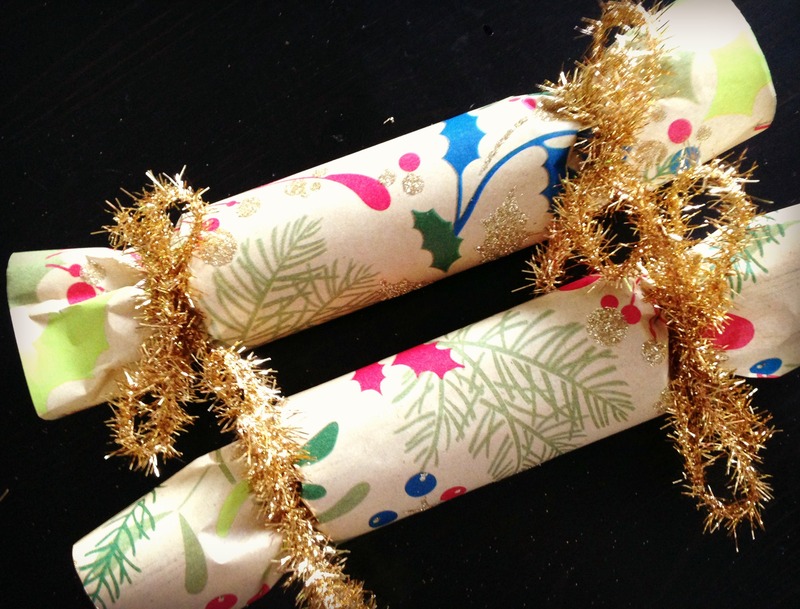 We’ll call these the “lazy girl holiday crackers.” They still look cute, and they still contain a treat, so that’s two important factors still in play, here. They would still be fun to pull apart at a dinner party! -Small toys, pieces of candy, message strips, confetti, etc. 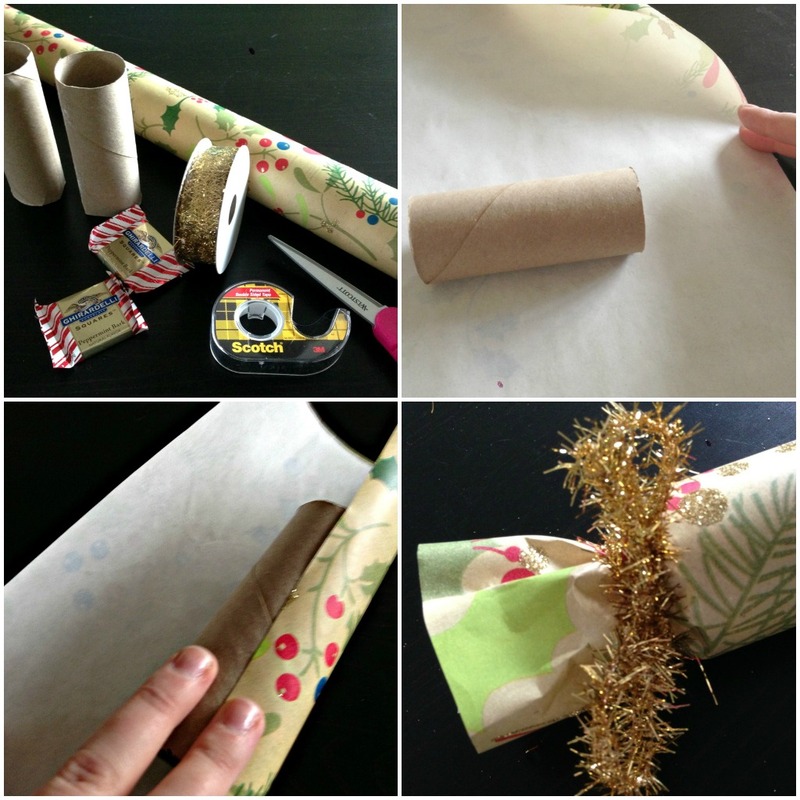 Cut a piece of wrapping paper big enough to cover the tube, with 2-3 inches of extra paper on each end of the tube. Place strip of double-sided tape across the cardboard tube & secure the first end of the paper in place. Roll the paper around the tube & secure the end with double-sided tape. 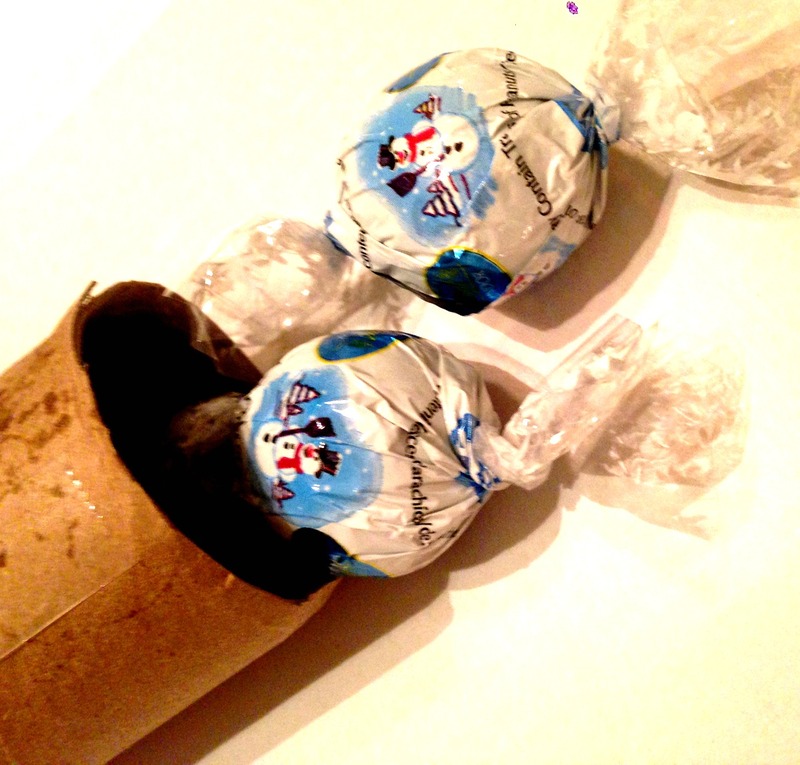 Carefully fill the wrapped-up tube with your candy/toy/etc., and complete the cracker by tying the ends with ribbon. There are so many fun ways you can personalize these – you can mix up the paper, the secret treats inside, the ribbons & the size to make the perfect crackers for your dinner party! 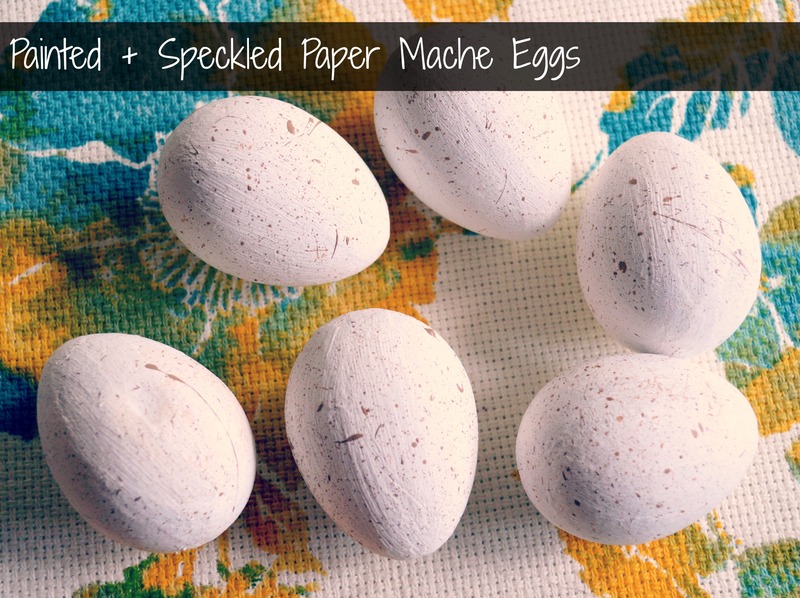 I love this kind of quick, easy & inexpensive DIY! One of my favorite home design blogs is Bliss at Home. I’ve been following Kristy’s blog for several months now, and I love her modern & glam design and DIY ideas. Bliss at Home is part of a Home for the Holidays Link Party, featuring fun holiday craft & design categories throughout December. 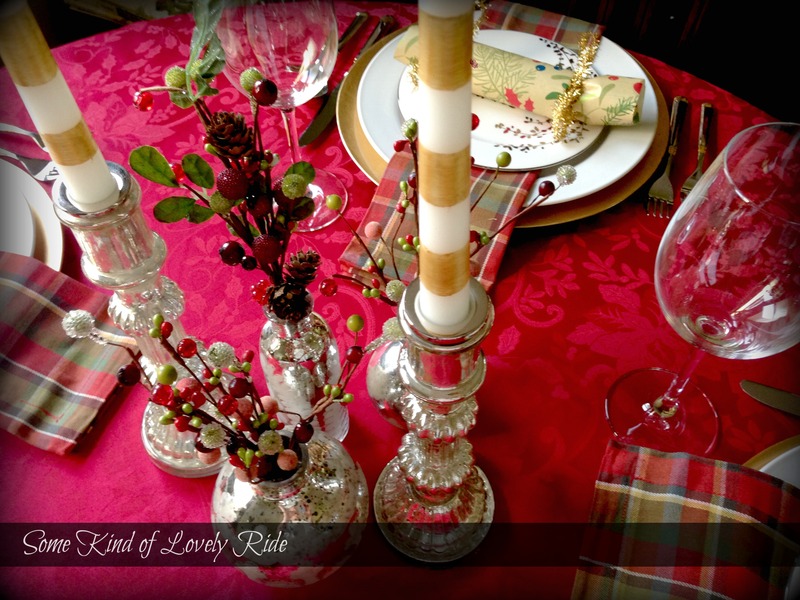 I was optimistic that I would find the time in this super busy week to make up a table display to link up to the Bliss at Home Holiday Tablescape link party. It closes today, so I’m just in time! My husband and I rarely entertain, mainly because our apartment is rather small (but cozy!) I’ve got quite the itch to have a little holiday dinner party or get together this year, though, now that we are blissfully married & our small-but-cozy home has been filled with lovely gifts from our generous friends & family. 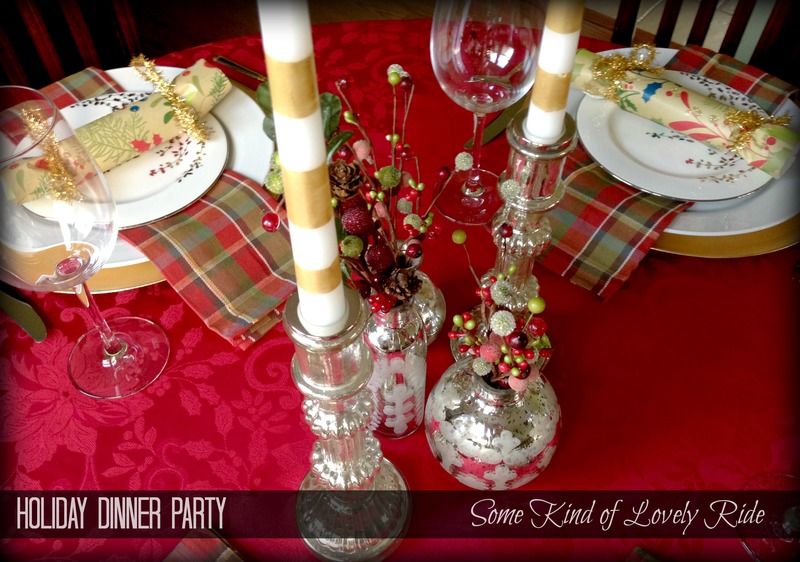 The table I laid out would be perfect for an intimate dinner party with friends, utilizing bright Christmas red & greens, and the metallic hues of silver and gold. Each place setting consists of a gold charger and a plain white dinner plate mixed with the salad plates from our brand new wedding china. 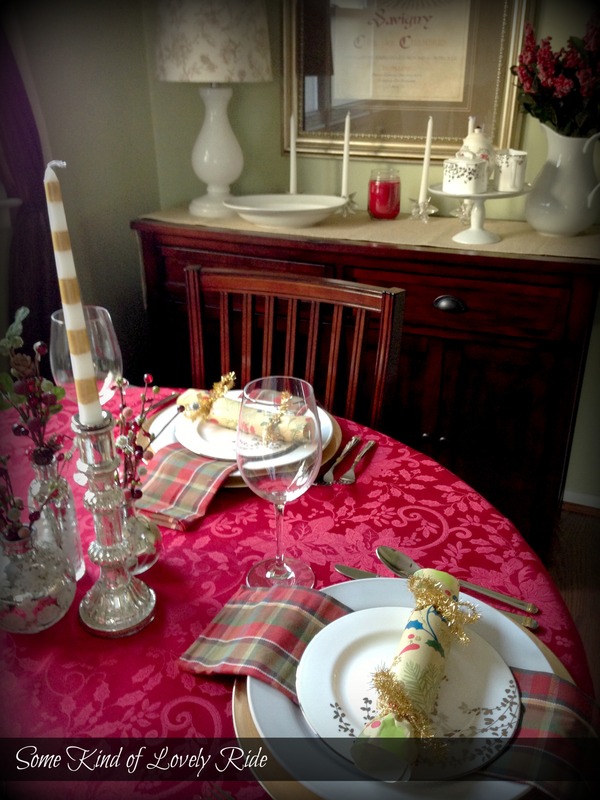 The table is covered in a red holiday tablecloth I picked up at the Christmas Tree Shop for about $5. 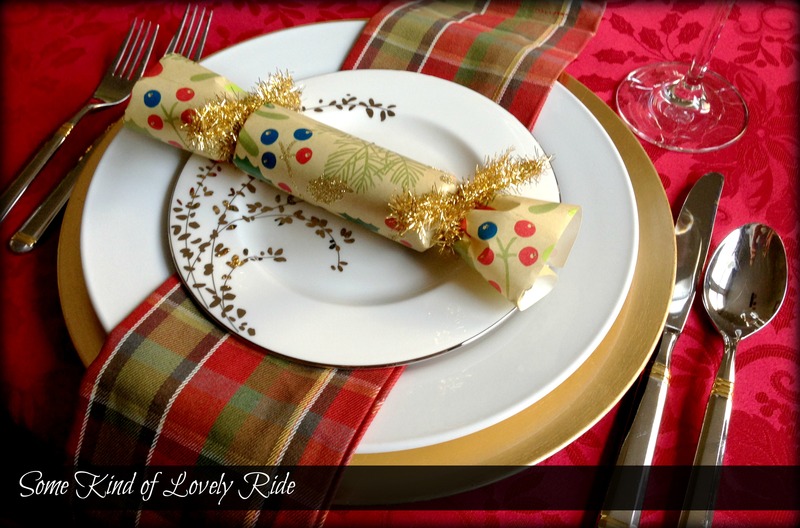 The pretty plaid napkins are from Pottery Barn. 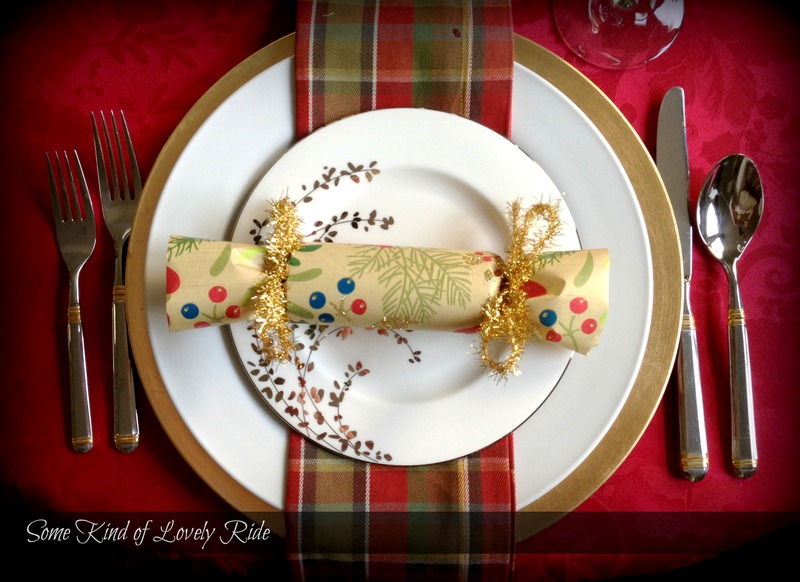 I topped each place setting off with a DIY holiday cracker – a staple for holiday dinners at my both parents & in-laws’ homes. 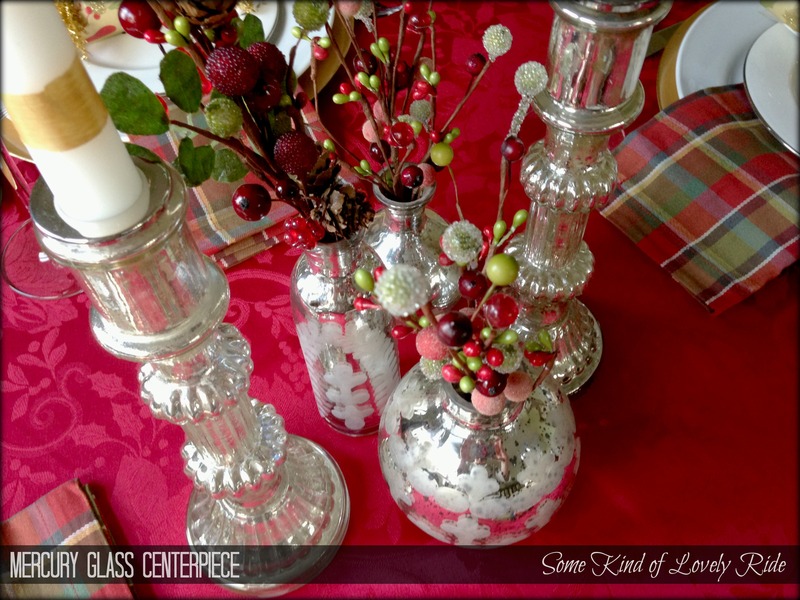 In the background is our buffet, topped with candles, a pitcher filled with holiday berries, and more entertaining essentials like a creamer & sugar bowl! So, Now that the table is all laid out- who is coming over for dinner? I can’t believe Thanksgiving is nearly here! I’m looking forward to spending the holiday with my family. Since I am not faced with the task of cleaning, cooking & decorating for guests, I daydreamed today about a lovely Thanksgiving table in silver, gold & autumn hues. It’s much easier to imagine & browse my favorite home decor online stores (the 21st century version of window shopping?) than to actually pull the whole event together, I am sure! 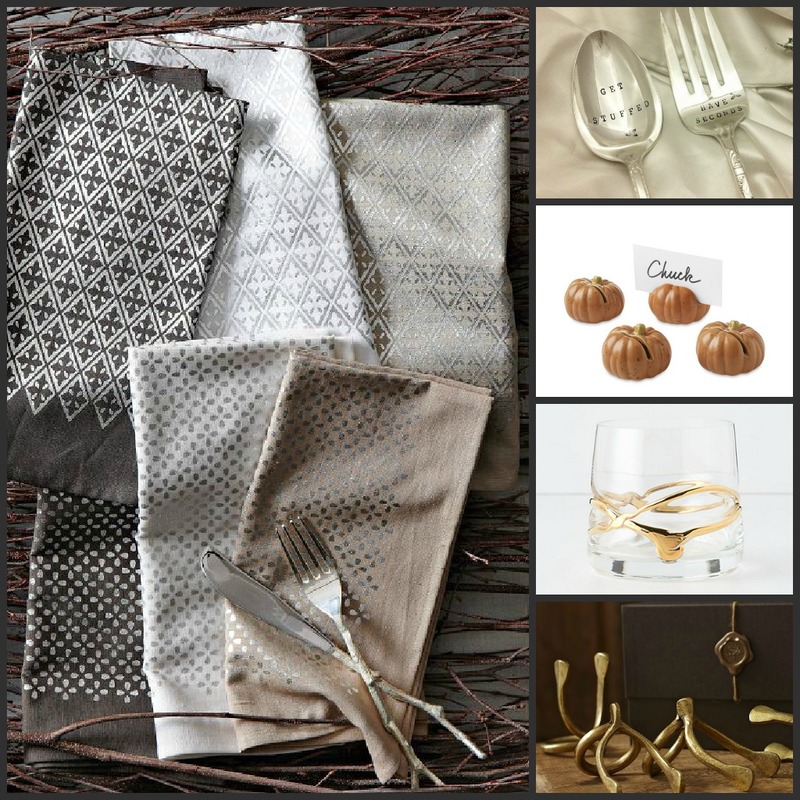 Clockwise, from left: 1) Metallic Diamond Printed Napkin Set – $25 for set of 4 (sale price) from West Elm. 2) Hand-stamped vintage serving spoons – $24 for two from Blithe Vintage on Etsy. 3) Pumpkin Place-Card Holders – $14.99 for set of 4 (sale price) from Williams-Sonoma. 4) Twisted Gold Tumbler – $16.00 from Anthropologie. 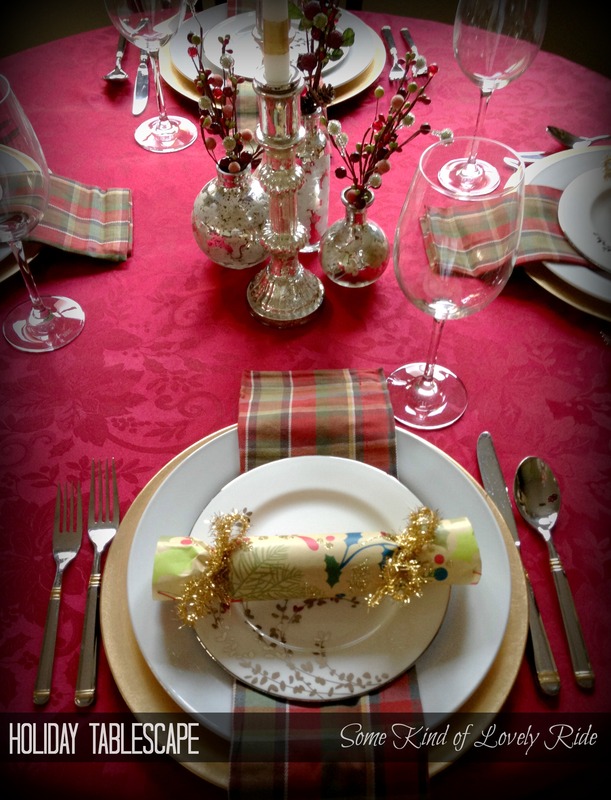 5) Gold Wishbone Napkin Rings – $39.50 for set of 4 from Pottery Barn. So, what about you? Planning your own Thanksgiving feast, or letting friends or family do all the work & just enjoying the eats? P.S. If you’ve been following my chronicles of wedding projects – just taking a little break, there is a lot more to come!